Astigmatism is a common eye focusing problem where light rays entering the eye become focused by the cornea and lens at different distances from the retina. This causes some parts of the image to be more out of focus than others, thereby affecting your visual acuity. Astigmatic errors are due to the shape of the eye being irregular, such that it is shaped more like an oblong football rather than a basketball. This condition is sometimes inherited, but it often occurs as a normal characteristic of growth. Sometimes, this can be due to keratoconus, corneal transplant surgery, previous injury, or to something pressing on the eyeball, such as an eyelid stye. Astigmatic errors occur in around 30% of children and adults. 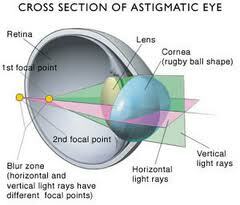 Astigmatism can occur due to an irregularity of the shape of the cornea or lens or both. This results in the light rays in the horizontal and vertical planes being focused at different locations. In an eye without astigmatism, the light rays in the horizontal and vertical planes become focused at one single point, giving a crisp and sharp image. WHAT SYMPTOMS CAN YOU EXPECT FROM ASTIGMATISM? 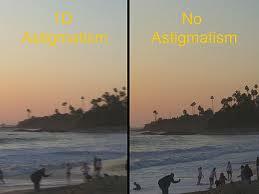 Let’s give an example of the effect of astigmatism. Take today’s newspapers and place it in front of you in your normal reading position. Then TILT the top of the newspaper page downwards away from you. You will notice that from top to bottom, the sentences running across the page are focused differently. These are how images may appear to you if you have an astigmatic eye. This irregular focusing of light causes a blur that makes things uncomfortable to look at. It may give you headaches, tiredness and poor concentration. You will feel this more if you are concentrating on anything for a long period of time. Unfortunately, it affects vision at all distances, from looking at distant signposts while driving to close reading. Your eyes tire if they have to keep focusing back and forth between 2 slightly different images. Sometimes, you may subconsciously ‘screw up’ your eyes to see better – this causes the muscles of the eyelids and face to become uncomfortable and fatigued. Up to 30% of children have this problem. This can affect your child’s ability to see well in school and during sports. If occurring at a young age (less than 7 years old), this can cause permanent blurry vision from amblyopia if not treated. Make sure you and your child attend regular eye checks to detect any astigmatic errors. HOW CAN ASTIGMATISM BE TREATED? Eye comfort and ease of seeing are improved when the astigmatic error is corrected. Any underlying disease causing a physical deformation of the eyeball (such as eyelid stye) should be treated first. Once this is successfully treated, the external pressure exerted upon the eyeball is relieved and the eyeball returns to the original, regular shape. Spectacle glasses and contact lenses are the mainstays of treatment. They are usually able to counteract the shape of the eye that is causing difficulty (unless the astigmatism is extreme). This corrects the difference in focus between the different parts of the seen image by. 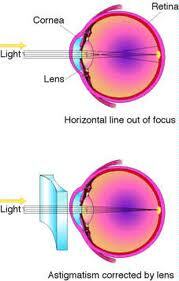 To correct any astigmatic errors, glasses are designed to have 2 different strengths within the same spectacle lens. Glasses and contact lenses generally work best when worn all the time. Sometimes however, they are only needed for certain activities. A new prescription correcting astigmatic errors can cause discomfort, giddiness and unsteadiness for the first few days. This is due to the correction of the distorted blur that you were used to. You may notice that walls slope or objects appear in odd shapes. Most people adjust well, but you may need to have the prescription strength reduced slightly to feel comfortable again. - Sphere: This indicates the overall amount of power (in diopters, D) to uniformly sharpen your focus to the most acceptable level. The plus sign indicates hyperopia. A minus sign indicates myopia. In the example above, the sphere has a value of +2.50 D.
- Cylinder: This shows the amount of astigmatism (in diopters, D). The cylinder in the example above is -1.50 D.
- Axis: This indicates the angle (in degrees)needed to correct the astigmatic error. The angle of astigmatism is 90 degrees in the example above. Laser refractive surgery involves reshaping the cornea so that light entering the eye can be focused uniformly onto the retina. There are different techniques available, including photorefractive keratectomy (PRK) and laser assisted in situ keratomileusis (LASIK). In PRK, the laser removes micro-thin slices of your cornea. In LASIK, the laser creates and lifts a flap of cornea before remodeling the tissue underneath. The flap is repositioned once remodeling is complete. Wavefront technology now enables astigmatic correction to a very precise level. This means that you are unlikely to need glasses or contact lenses after laser refractive surgery. Complementary therapies range from eye exercises to acupuncture to herbal remedies. Most of these treatments help by alleviating the symptoms of eye strain from untreated astigmatism rather than permanently curing your astigmatic error.